Nolan Ryan and Robin Ventura both had successful baseball careers. Each has numerous awards and accolades next to their name. But mention both in the same sentence and one moment comes to mind – August 4, 1993. Robin Ventura got an RBI single off of Ryan in the first-inning that day. Later on, White Sox pitcher Alex Fernandez hit Juan Gonzalez. When Ventura came up to bat again in the third, Ryan hit him in the upper arm. Ventura took a few steps toward first and then charged the mound. For some reason, Ventura decided to slow down as he got closer to Ryan. That gave Nolan Ryan the extra time to get his glove off. Despite being twenty years older than Robin Ventura, Nolan Ryan put up a great fight. Most would call him the winner. 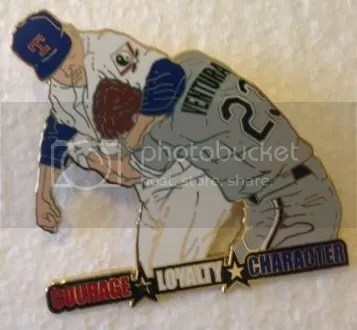 The image of Nolan Ryan holding Robin Ventura in a headlock is iconic. Sometimes you’ll even come across a signed photo with one or both of their signatures. It sure makes for an excellent conversation piece. Its not uncommon for Little League districts to make their own line of pins to hand out. Many of them use the names/logos of well known people, places, and things. A few years ago while attending the Little League World Series I was handed a pin of George Washington crossing the Delaware River. Instead of holding paddles, they had baseball bats. See what I’m getting at here? Districts can get away with a lot more than Little League itself. I’m not certain as to which year this pin was made. It does come from a Little League district in California. The yinyang symbol on Nolan Ryan’s arm indicates that. You have to laugh at the irony of a pin that encourages courage, loyalty, and character yet depicts two grown professional athletes fighting. This pin is widely sought after. They rarely show up for sale. In March one sold for almost $70.00.